In uma-harashi, two horses run at the same time, competing on the beauty of their running style and the accuracy of their rhythm. At the Okinawa Kodomo no Kuni, Zoo & Museum in Okinawa City on December 1. Okinawan traditional horse racing, known locally as uma-harashi, was held at the Okinawa Kodomo no Kuni, Zoo & Museum in Okinawa City on December 1. Participants competed on the beauty of their running style and the accuracy of their rhythm. A total of 30 horses, including native Okinawan breeds and others from the West, took part from various parts of the prefecture. 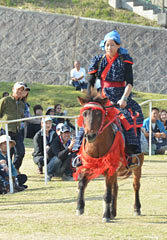 A Yonaguni uma horse called Dunan, which belongs to the Okinawa Kodomo no Kuni, won its third consecutive title. The horses run parallel to each other using a unique Okinawan style of moving their right front and rear legs at the same time. The jockeys wear clothes made of Chibana hana-ui with characteristic white patterns against an indigo blue background. They also wear traditional Kumejima Island folk articles.